From Wikipedia’s definition of astrology, astrologers study the movements and relative positions of celestial objects as a means of divining information about human affairs and terrestrial affairs. That is why with their birth signs, many people check on the newspaper’s daily horoscope, hoping to see the best of their “luck” for each particular day. The stock trader is vigilant on the stock market’s daily trend so they know well on which stock to invest or sell. An aggressive journalist will always be on guard for fresh and daily current events on streets and elsewhere to make a scoop for the day. Thank God, as His children, we need not hurdle through the likeness of what was said above to experience a daily dose of His steadfast love and mercy. More doubtless than the sun rising from the East and its setting down on the West, God’s love and mercy is always new every morning! In God, there is no recycled brewed coffee. Each day is freshly brewed and delivered with love! God’s blessings come in different forms and mediums because they are craftily formed for our needs. Today’s needs may differ from yesterday’s so don’t expect to receive just the same blessing today. Each day is uniquely created. He is an omniscient God and He knows best! Because of His inexhaustible mercy, we have been forgiven, owned and taken care of. God’s love and mercy is the reason beyond why I write this and the same reason why you are reading it right now. So, the next time you open your eyes in the morning and feel like starting to worry about the day, let God be God in your life. 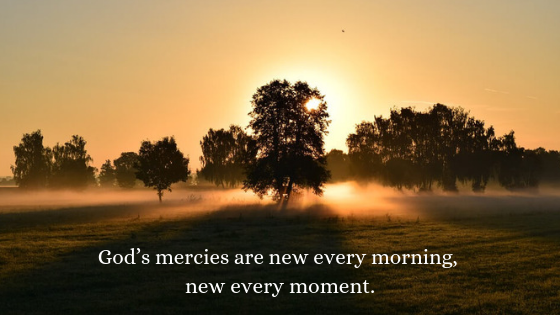 His overflowing love and immeasurable mercy are always new each day.